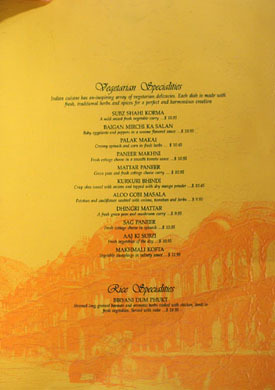 Following a rousing meal at Zaytinya the previous night, we were suddenly in the mood for Indian. After doing some research, Rasika, with its upscale take on the cuisine, caught my attention; unfortunately, when I called for a reservation, the restaurant was completely booked--surprising on a Wednesday night. Thus, it was time for Plan B: Heritage India, which, compared to the likes of newcomer Rasika, may seem like the grande dame of Indian cuisine in DC. Residing in the old spot of Germaine Swanson's eponymous pan-Asian eatery Germaine's, Heritage India is the brainchild of Heritage Group owner Sanjeev Tuli. A graduate of the Oberoi School of Hotel Management, Tuli started off working in various Oberoi Group properties in Nepal, Sri Lanka, India, and Egypt. Later, he went over to the Taj Group, heading food and beverage operations. Realizing that his passion lay with restaurants, Tuli eventually moved to Frankfurt, where, in 1992, he established the well-regarded Jewel of India chain of eateries. Tuli's next move was to the US; in 1999, he opened Heritage India, Glover Park (the subject of this post) with partner and former Bombay Club chef Sudhir Seth (who left in 2003 to start Passage to India). 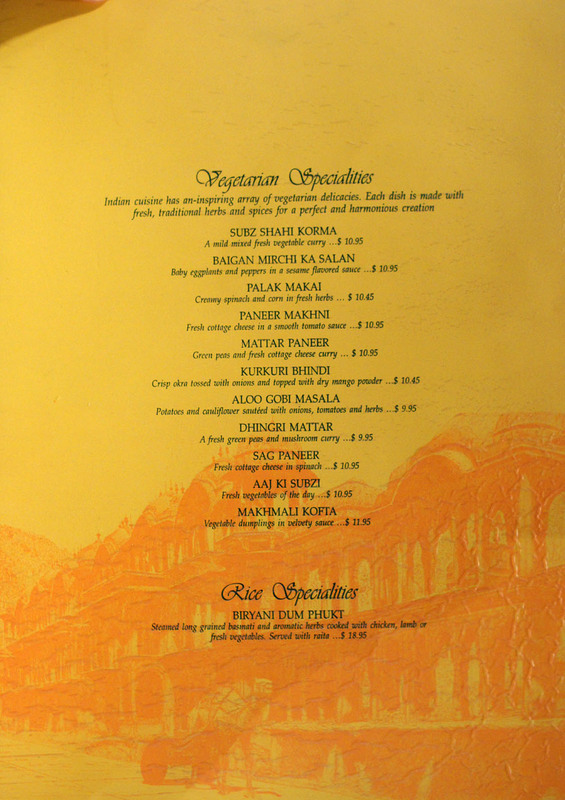 The restaurant achieved considerable success, and was widely deemed one of the top Indian spots in the DC metro area. 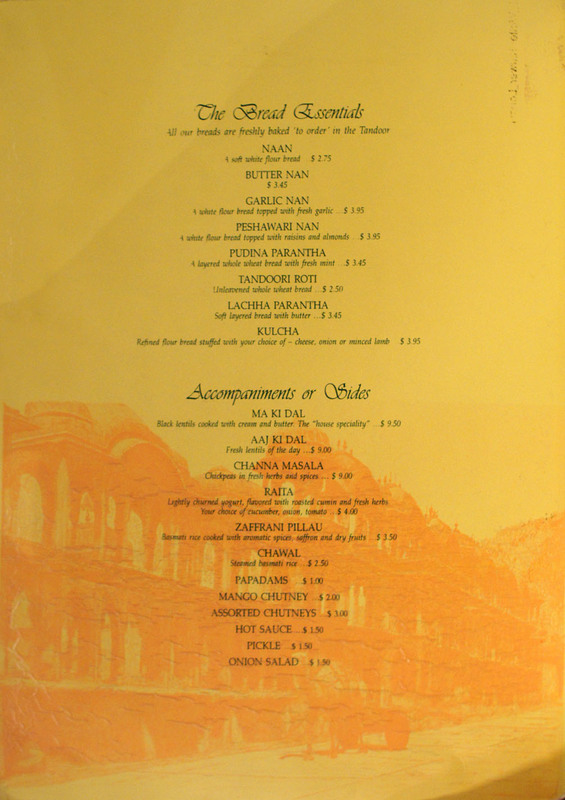 Riding on the success of the first Heritage India, Tuli opened another, larger, trendier location in DC's Dupont Circle in 2004 (in the space of the old Acropolis nightclub). 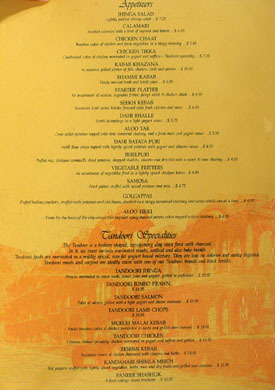 The new restaurant features a menu of "contemporary" Indian small plates (think tapas), as well as dishes with international influence. 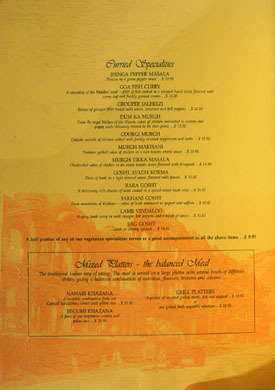 In 2007, Tuli moved away from Indian, and opened Zodiac Grill and Lounge, a casual American eatery in Gaithersburg, MD. Perhaps he shouldn't have strayed outside his "naan and ghee," as Zodiac shuttered late last year due to liquor board violations. Tuli's latest expansion came in 2008, when he ventured back to his country of birth and opened Magnolia, an Indian restaurant (replete with its own in-house Chinese eatery!) in Gurgaon, Haryana. Bad news for Tuli came earlier this year, when Atul Bhola, a former manager at Heritage India, left to open his own Indian restaurant, Masala Art, poaching Tuli's long-time chef Surinder Kumar in the process. Replacing Kumar is Heritage India veteran Mohan Singh. The interior space, draped in shades of pumpkin, is a step above the dining rooms of most Indian restaurants. In addition to the main area shown above, there's also a large room in the back, useful for private parties. 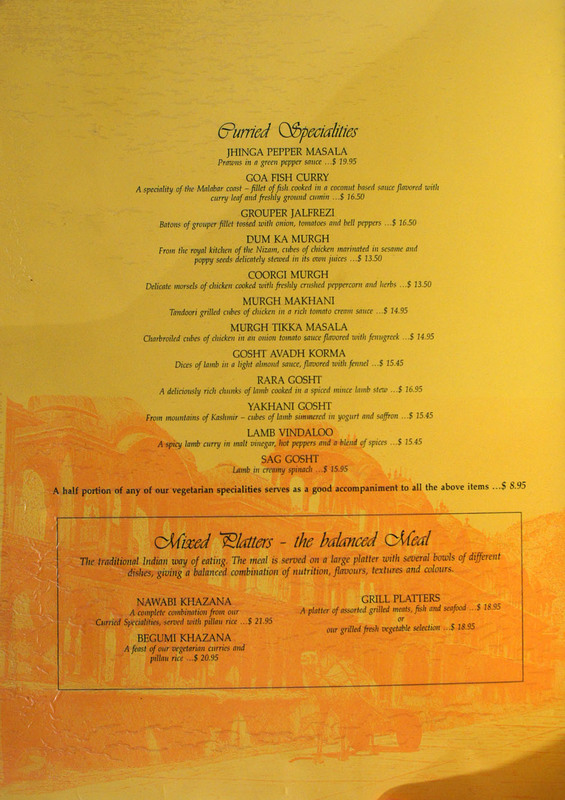 The menu is fairly traditional--you'll have no problem finding your chicken tikka masala--though there are a few curveballs thrown in for good measure. Click for larger versions. Meanwhile, the list of libations is more extensive than most. Click for larger versions. 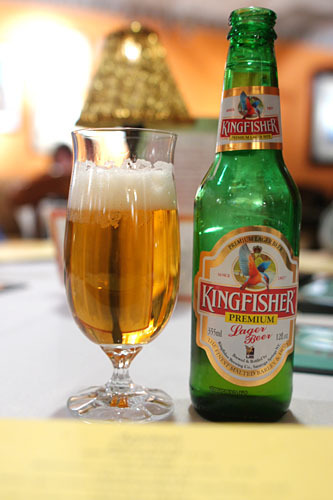 To drink, I started off with a Kingfisher Premium [$5.95], a prototypical Indian lager, and the country's largest selling beer. 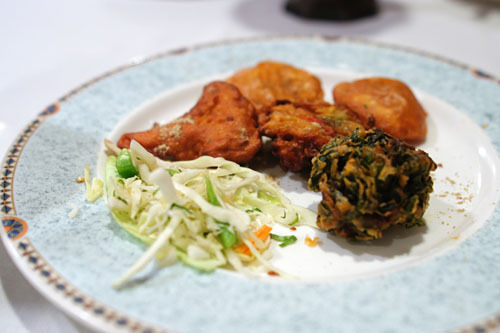 Clearly, these were pakoras, so I was left wondering as to why they weren't labeled as such on the menu. No matter, this was certainly a competent preparation of the ubiquitous fritters. I appreciated how the character of the various vegetables was preserved--not overwhelmed by the batter--as well as the hint of spice on the finish. 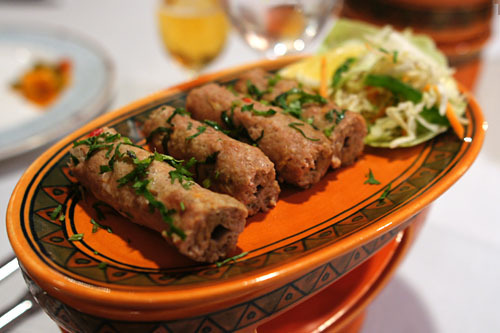 One of the more popular kebabs is of the seekh variety, consisting of finely minced meat (usually lamb in my experience), cooked in the tandoor. This was one of the better versions I've had--immensely flavorful, tender, with a nice spice and a fantastic temper from the cilantro and mint. 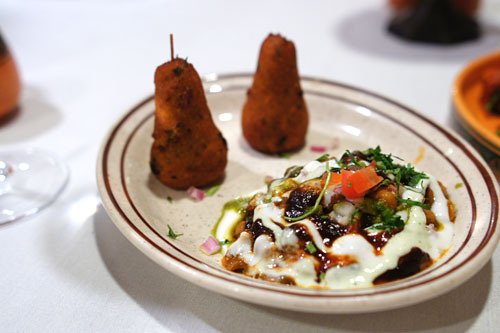 Literally "potato croquette," aloo tikki is a preparation of mashed boiled potato, typically served with various accompaniments. In this case, a savory mixture of tamarind chutney and raita served to balance the relative austerity of the potato. 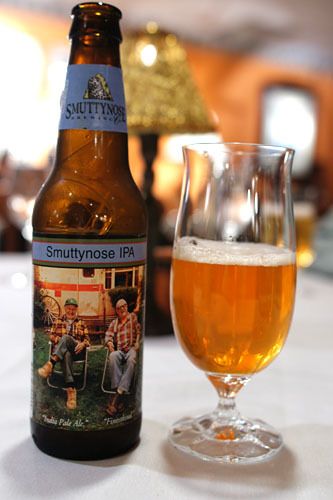 By far the most interesting item on the beer list was the Smuttynose India Pale Ale "Finest Kind" [$6.95], a lovely American IPA with a great herbal spiciness to go along with the bitter hops. 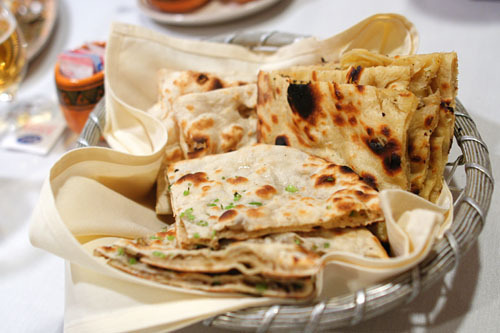 One seemingly cannot escape a (North) Indian meal without ordering naan, and tonight was no exception. The example presented here was as expected. Far more interesting was the lachna paratha, a firmer, multilayered affair somewhat reminiscent of Chinese-style chong you bing, and the onion kulcha, a more substantial bread with a nice onion tang. 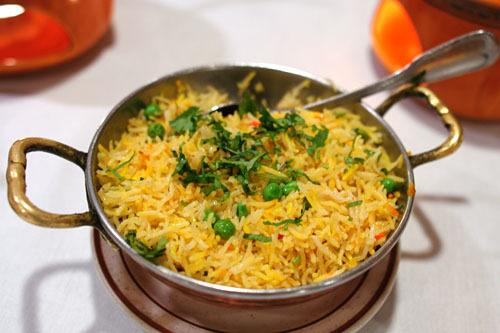 Besides naan, rice is the other obvious accoutrement in Indian cuisine. This was certainly a worthy example, and I especially appreciated the use of peas in the commixture. 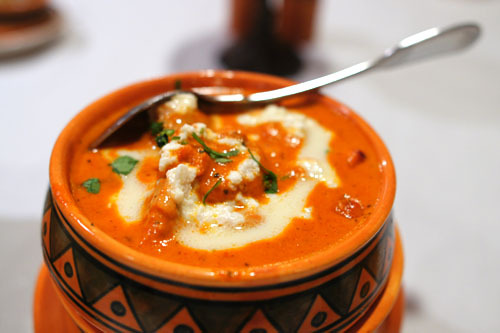 Virtually every North Indian restaurant out there will have some version of butter chicken, so it serves as a sort of gauge for me--I almost have to order it on my first visit to a new place. 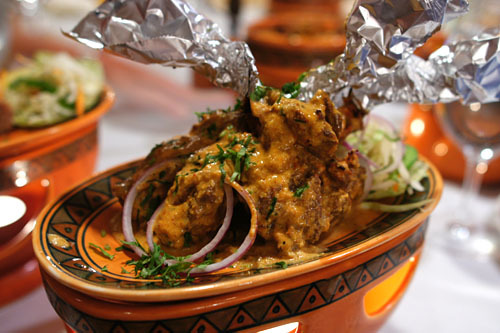 Originally from the state of Punjab, the dish is basically yogurt- and spice-marinated chicken, cooked and mixed with a butter- and tomato-based sauce. The example here was a good, but not great preparation: heavy on the tomato and with the chunks of meat cut a bit too large. Reshmi kebabs can almost be thought of as the chicken counterparts to the lamb-based seekh kebabs above, but I actually liked these better. They had an immensely delectable savor, not quite chicken-y, but beautifully balanced by the piquancy of the coriander. 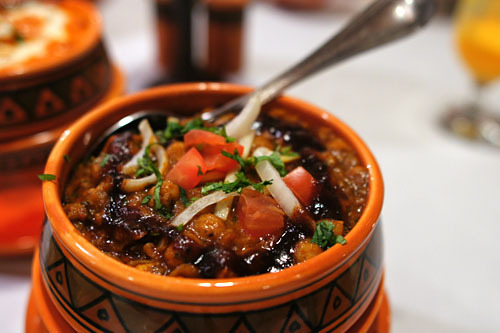 Here we have a dish of chickpeas, cooked with various spices, chilies, onion, and tomato--another Punjabi specialty. This was easily the spiciest dish that we had, with the mild, earthy flavor of the chole tightly accented by a marked sourness, and, of course, the heat of chili pepper. The lamb chops, unfortunately, were a let down. Their flavor was passable--quite lamb-y, balanced by a touch of yogurt--but the meat was simply overcooked, rendering the chops dry and overly tough. Mattar paneer is quickly becoming my favorite vegetarian dish, so it came as no surprise that it was the strongest course of the meal for me. 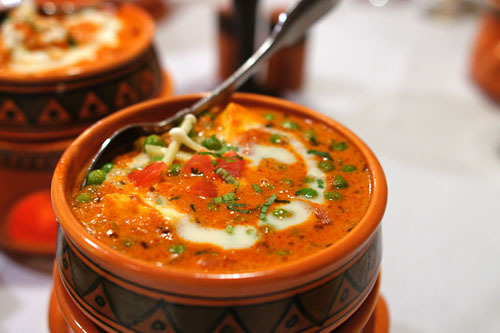 The dish is simply an admixture of peas and cheese, cooked in a masala-esque sauce. The peas here were delightfully firm, and full of bright, vegetal flavor, while the paneer was soft, creamy, mild. Their combination with the sweetly spicy sauce was a perfect pairing. 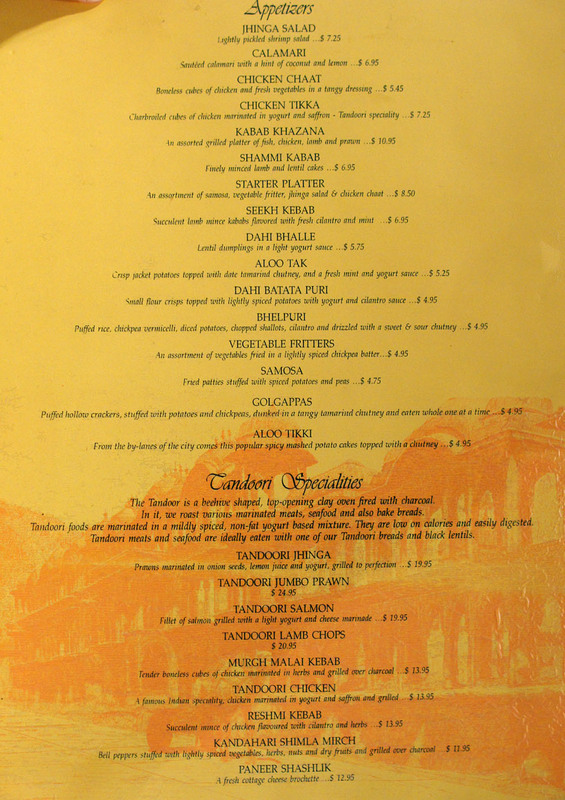 Unlike Rasika or even the restaurant's own Dupont Circle location, Heritage India doesn't stray too far from the norm; it presents classic Indian cuisine, straight up and without too much pretense. 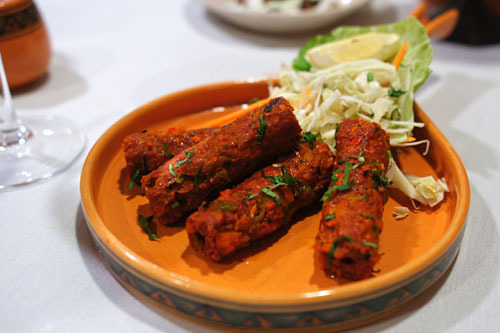 Though the food did have its share of faults, it was still a notch above your typical Indian fare. Indeed, Heritage India has been around for over a decade, and it wouldn't surprise me if it lasted a decade more. Jo: I hadn't heard of Gangadin before, but it looks pretty good. What dishes did you order for your wedding? Anon: Yep, I saw that. Interestingly, someone linked to one of my LudoBites posts in the thread. I'm all for photography, but I agree with Achatz that there should be limits to it. Of course, I eschew flash, and turn off AF assist and any sounds. Tripods seem a bit ridiculous, and three minutes to shoot a single dish is absurd (I keep it under 30s). Video should be used sparingly.